Earning both undergraduate and graduate degrees from one institution is more common now than ever before for a variety of reasons. While it does depend upon the student and the student’s research and connection with faculty, sometimes completing all degrees at the same institution has major advantages. Washington State University graduate Nicole Kelp is a good example. Nicole is a recent graduate of WSU’s Molecular Bioscience Ph.D. program, and currently works as an instructor for the university. 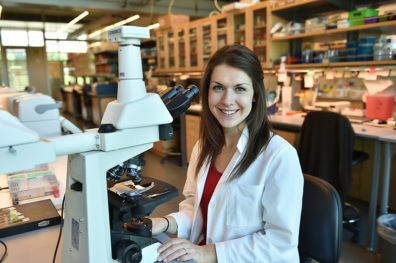 Her doctoral research focused on uterine biology, specifically tracking one particular protein and linking it to miscarriage, infertility, and uterine cancer. “I think it’s really important for students to try things outside of where they thought they were going to go, because I never thought I would want to study uterine biology, but I found it fascinating,” says Nicole. Nicole came to WSU from Boise, Idaho, right after high school because of the STARS program (Students Targeted toward Advanced Research Studies), which paid her a stipend in exchange for lab work. The STARS program in the School of Molecular Biosciences (SMB) was created to facilitate a seamless transition from high school to graduate level courses in the School of Molecular Biosciences or Integrated Physiology and Neurosciences. Participants are usually incoming freshmen interested in pursuing graduate degrees in the sciences. The program was designed by SMB faculty at WSU to specifically help highly motivated students jumpstart and accelerate their academic careers through faculty mentoring, scholarships, and summer job opportunities. Students have the opportunity to earn a bachelor’s degree in biochemistry, genetics and cell biology, microbiology, or neuroscience in as little as three years, and a doctoral degree in as little as seven years. \Consequently, Nicole has earned all of her degrees at WSU, in part because of the STARS program, but also because of the many faculty members who mentored and encouraged her along the way. According to her, there are a number of advantages to remaining at an institution to earn your graduate degree—first and foremost is the networking. “You’re already known in the department, so there may be more opportunities available to you,” says Nicole. During her time at WSU, Nicole worked alongside professors Jim Pru and Margaret Black, as well as others. Working in different labs alongside different professors helped her explore various interests. As an undergraduate, she initially wanted to focus on cancer research, but used rotations to her advantage to gain experience and find her niche. Like most graduate students at WSU, Nicole was able to fully fund her degree through a combination of grants and assistantships. Through grants, scholarships, and assistantships, most graduate students are able to find some type of funding to help pay for, or fully fund, their graduate education. At the start of her graduate career, Nicole earned a National Science Foundation grant that gave her three years of funding. She attributes her grant award to the help of her faculty mentors in outlining her research and gathering preliminary data. 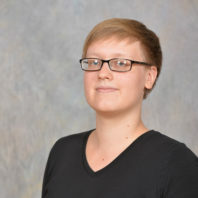 Since earning this grant, she has helped with several of the professional development seminars sponsored by various graduate programs on the WSU campus. If you’re interested in pursuing a graduate degree, contact the WSU Graduate School for a consultation at 509-335-6424, gradschool.wsu.edu, or info@gradschool.wsu.edu.